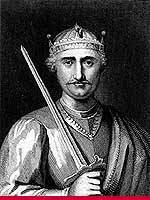 WILLIAM I, THE CONQUEROR (1027?-1087), was the first Norman king of England. He took power in 1066, following his army's victory over the Anglo-Saxons of England. As king, William maintained tight control over the country's central government. William was born at Falaise, in the Normandy region of northwestern France. He was the son of Robert I, Duke of Normandy, and inherited Normandy in 1035, at about the age of 8. During his youth, there were many disorders. In 1047, William put down a great rebellion at the battle of Val-es-dunes, near Caen, with the aid of his lord, King Henry I of France. From that time on, William ruled Normandy with an iron hand. William claimed that King Edward the Confessor of England promised him succession to the English throne as Edward's nearest adult heir. However, Edward's brother-in-law Harold became king in 1066 through a deathbed grant by Edward and election by the nobles. William promptly prepared to invade England. But before William could sail, the king of Norway invaded northern England. King Harold hurried north and defeated the Norwegian invaders at Stamford Bridge, near York. William landed before Harold could return to defend the southern coast. The Normans destroyed the Anglo-Saxon army and killed Harold at the Battle of Hastings on Oct. 14, 1066. On Christmas Day, 1066, William was crowned king. William then put down local rebellions. He took lands from those who resisted him. He kept some of these lands for himself and gave the rest to his followers in return for military service. To emphasize the lawfulness of his crown, William confirmed the laws of Edward the Confessor and kept all the powers of the Anglo-Saxon monarchy. He levied Danegeld, the only national tax on landed property in all of Europe at that time. At Salisbury in 1086, he made all the landholders swear allegiance directly to him as king. William was devout, firm in purpose, and unchanging in gaining his ends. His greatest monument is Domesday Book, a survey of the land and principal landholders of his realm. KING 1066-1087 14 Oct 1066 = Battle of Hastings. Bayeux, an equally mighty prince of the Church. suddenly and the eight/ or nine year old William found himself Duke of Normandy. or seven years old, that he finally emerged as the undisputed Duke of Normandy. of Maine - he reorganised the structure of Norman society. close to six feet, immensely strong and tough, with a harsh guttural voice. not love or even compatibility, were the hallmarks of royal alliances. much experience in the treacherous, turbulent years of his youth. would not produce an heir. Duke William as the next rightful King of England, nominated by King Edward. actually swore his oath varies even in the Norman accounts. the papal seal of approval for a justified invasion, bearing a holy banner. William beat King Harold even more decisively than he did in battle. and was itself invalid, apart from the fact that Harold had forsworn himself. arrived, Harold Hardrada of Norway who was a claimant to the English throne. allegedly made by them to Hardrad's father. Britain knows the date, the battle of Hastings 1066.
an arrow in his eye, and the Saxon forces scattered into the night. Update: from Queen's Official Web Site 8/10/97. there, dealing with rebellions and French invasions. William II Rufus (reigned 1087-1100).